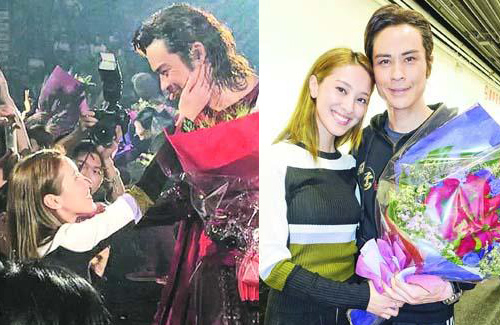 Although Grace Chan (陳凱琳) already attended two previous performances of Kevin Cheng‘s (鄭嘉穎) The Storm Show <風雲5D音樂劇>, she made sure to see the final show. Grace especially flew back from Vancouver and joined Kevin’s mother in the audience. Besides Grace, many of Kevin’s friends came to support the show, including Kenneth Ma (馬國明), Natalie Tong (唐詩詠), and Jazz Lam (林子善). Ending their show with a thrill, Kevin, Michael Tse (謝天華), Wayne Lai (黎耀祥) and Ray Lui (呂良偉) even splashed water on front-row audiences in one of the final scenes. When Kevin walked down to greet the audience, Grace presented Kevin with flowers. In return, Kevin lightly touched Grace’s cheeks to show his affection. Thanking his girlfriend during the aftershow interview, Kevin said he was grateful to have Grace’s support throughout the production. Afterwards, the cast and crew went out to celebrate. Having led a life as an actor for the past two decades, Kevin felt like it has been an entire lifetime since he was a singer. Purposely losing over 20 pounds for The Storm Show, Kevin said he can finally take a long break and eat a good meal again. Either that’s a bad photo or Kevin is really showing his age. And he best get a move on if he wants a daughter…. how do these celebrities lose 20 pounds so easily when they are already skin and bones? do they just don’t eat>? He’s trying to stay in league with a young woman… well Kevin’s gotta start on that Botox. Take a few pointers from Aaron Kwok + Andy Lau. Well, Kevin Cheng does look younger than Aaron Kwok and Andy Lau. Amongst the 3 Aaron looks in great physical shape. How to compare? @funnlim @rainbow28 – yeah, what funnlim said. it’s clear that kevin has been showing his age dramatically these last few years. me thinks andy & aaron has aged better, esp with cosmetic help. louis koo is getting there too, unfortunately. I quite like louis. I think Kevin, Louis Koo, and Moses Chan all look around the same age. Aaron used to be boyish type so his type might help him look more youthful. Plus he exercises a lot (such as being a great dancer). Andy looks attractive and in good shape for his age. It’s hard to look like not aging at that age. I read it somewhere long time ago that Kevin has hereditary diabetes which probably causes him to age faster? @rainbow28 Type 1 diabete does not affect the pace one ages; however, it does affect something else especially after the afflicted has well past middle age. Hehehe. It’s OK as long as he does not plan on having kids. @rainbow28 Oh yeah, I agree about Kevin & Louis – their looks have declined. Moses, I think he’s just gotten too skinny + his beard. Hate his beard. Louis & Kevin were boyish type too though. Pretty boys, just like Aaron. Only Moses don’t fit into that category. Andy + Aaron has definitely gotten some work done.